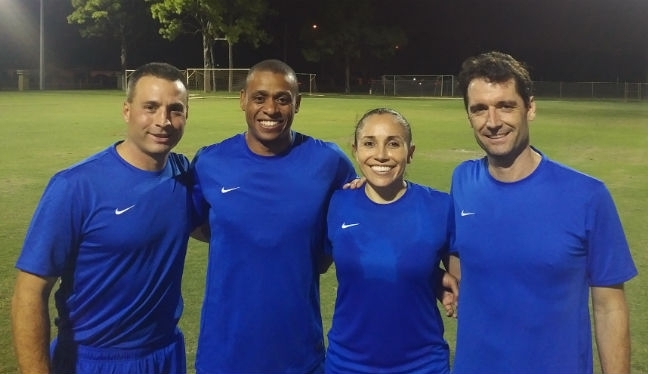 A number of PRO representatives were in attendance at CONCACAF’s Elite Course for Assistant Referees last week, when their physical and technical attributes were put to the test. Held in Miami, Florida, officials arrived on Wednesday before departure on Monday and, among them, was PRO Assistant Referee Joe Fletcher. Reflecting on the event, Fletcher said: “It was really good to see colleagues from CONCACAF. “It was also great to meet some new ones, as this was the first time CONCACAF has put on an Elite AR Course with both men and women in attendance. It only makes sense, as the the message is the same. The course’s busy schedule included the Change of Direction Ability Test (CODA) and the Assistant Referee Intermittent Endurance Test (ARIET) out on the field. Presentations and video tests were then held in the classroom, and officials also took part in some break-out group work. “The CODA Test is a speed test designed specifically for ARs,” Fletcher added. “We go 10 meters fowards, cut, eight meters sideways, cut, eight meters sideways, cut, 10 meters forwards. The workshop came towards the end of what has been a busy year for the experienced Fletcher, who has been involved in numerous competitions, both in North America and internationally. And those achievements have been added to his ever-growing list of honors, which also features involvement in the 2014 FIFA World Cup. “This year, I’ve had duty in the Champions League, World Cup Qualifying, MLS Regular Season, MLS Cup Playoffs and, of course, the pinnacle for the season – the Copa America Centenario.